This week, Baltimore is brimming with art, innovation, music, and plenty of light. As the city plays host to this one-of-a-kind light festival, Uber will be there to help festival-goers see Charm City like never before. From Thursday, March 31 through Sunday, April 3, Uber is teaming up with Sagamore and Under Armour to provide water taxi rides in the Inner Harbor. With UberBOAT, you’ll be able to travel between the Science Center and Harbor East with the tap of a button, while also seeing a view of Baltimore unlike any other. All rides will be free of charge, compliments of Sagamore. Here’s how you can experience the Light Festival with UberBOAT. 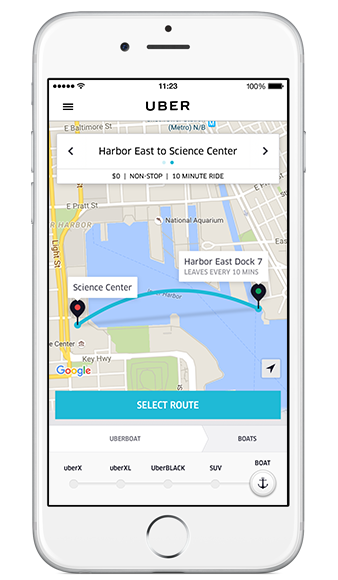 Select UberBOAT in your app when you are near either pickup point (Science Center or Harbor East). Select your route (Science Center to Harbor East or Harbor East to Science Center). Choose number of seats (can reserve up to 4). Head toward your designated pickup location (the docks at Science Center or Harbor East). UberBOAT will be available for request from 7-11pm nightly from Thursday, March 31 – Sunday, April 3. There are two UberBOAT pickup points: Science Center and Harbor East, with boats making non-stop trips to and from each point. Boats will run every 10-15 minutes. You can request an UberBOAT once you are near either pickup point. Each UberBOAT seats up to 11 riders. When you request a boat ride, you will be matched with other riders and placed on the next available boat. We anticipate high demand, so thanks in advance for your patience in working with us to ensure 4 nights of safe and enjoyable rides. Down. Set. Ride your way to the end zone.